Here is another all-time favorite Hansa Plush. Well, it is not a ferret, but Hansa squirrel is mighty cute and another one of my favorite critters. 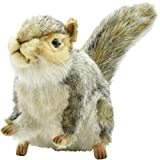 HANSA – Gray Sitting Squirrel Plush Toy – This Hansa Gray Squirrel is part of the Hansa Woodland Animals Collection. The Gray Squirrel’s approximate dimensions are 5.5 L x 3.5 W x 8 H. Suitable for ages 3 years old and up. When you hold these wonderfully ”life-like” animals, you will see and feel HANSA’s emphasis on quality, which is a result of careful attention to design, custom fabric selection, cutting, sewing, stuffing, eye placement, feature creation, framing, airbrushing and finishing. Since each animal is hand sewn, there will be slight variations in appearance. This entry was posted in Ferret Plushes, Uncategorized and tagged 190407, Gray, Hansa, Hansa Sitting Squirrel Plush, Hansa Squirrel Plush on November 24, 2018 by admin.